Just in time for Christmas, we have a great opportunity to win six Christmas books by six bestselling authors! There's enough here to keep some for yourself and to share the love by gifting some to your friends and family! 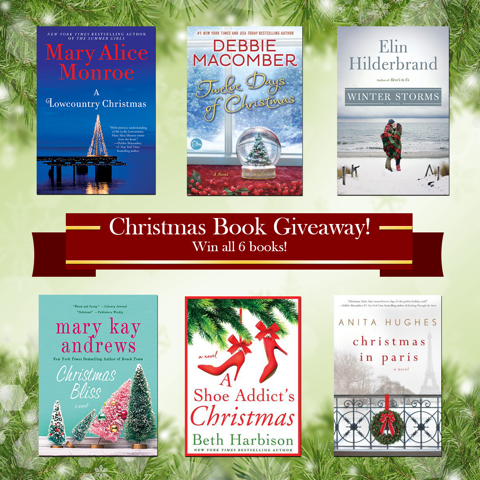 Enter to win A Lowcountry Christmas by Mary Alice Monroe, Christmas Bliss by Mary Kay Andrews, The Twelve Days of Christmas by Debbie Macomber, Winter Storms by Elin Hilderbrand, Christmas in Paris by Anita Hughes, and A Shoe Addict's Christmas by Beth Harbison. I reviewed three of these yesterday (I enjoyed them all!) and look forward to hopefully getting a chance to read the others. I just love Christmas books so much and am happy to offer this giveaway. You can enter by filling out the form below and the winner will be chosen on December 20th and notified via email. US entries only, please. Be sure the like the author's facebook pages as well so you can keep updated on what is going on with them as well as see any festive things they might post!